Yummy, Low Calorie Diet Food -- Plus Where to Buy! 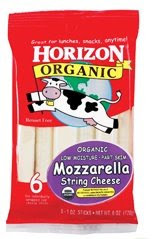 : Horizon Organic String Cheese -- Say Cheese! Horizon Organic String Cheese -- Say Cheese! I remember thinking I'd have to eliminate cheese back when I started watching my calories and what I ate. But, that didn't turn out to be true at all! While some cheese is high fat and not good for you, there are tons of cheese options out there that are actually really great diet and healthy food options. I've written about cheese before on Yummy Diet Food including posts on goat cheese, the best fat free cheese I've found (multiple flavors and it melts! ), as well as cooking with low fat and non fat cheese. But, I've never written about string cheese, so today I thought I'd dedicate a posting to it (also in anticipation for an upcoming recipe that uses it)! String cheese is by far one of my favorite snacks. It is low calorie, fun to eat, easy to transport, and is full of protein, healthy fat, and Calcium. There are tons of string cheeses on the market. I happen to eat Horizon Organic which I buy at Whole Foods, but any low moisture, part-skim mozzarella string cheese is likely going to be less than 100 calories (most are around 80, although I've found some for 50-60 calories in the past) and 5 or less grams of fat, and 5-8 grams of protein. Depending on the calories, each cheese stick ranges from 1-2 weight watchers points. If you like string cheese, you'll love my recipe for healthy breaded cheese sticks. That is coming next week or the week after (I need to snap a good picture). What is your favorite brand of string cheese or even any cheese? Or, if you don't like cheese, what do you eat instead? I like rice cheeze! I get the cheddar jack flavor - it's so good. They have it at WF. My brother loves string cheese - I've bought him the stuff from Sargento - I think I'll try some from Horizon! I LOVE Trader Joe's light cheese sticks....only 60 calories and 1 WW point! we love any and all STRING up in herre. I keep telling myself to buy string cheese but then I never do. I've got to get on the bandwagon. Never heard of Horizon, though. I've seen this in Tj's and always wanted to try it! :) now, i'll definitely buy it next time I go to Tj. Like the string cheese - have some Sargento in the fridge right now. It really is fun to eat. I recently discovered Cabot's 50% reduced fat cheese. It is the only good reduced fat cheese I have tasted. Oooh, I'm very excited about your upcoming recipe, Juliet. I love cheese! As for string cheese - which is such a great, portable snack - I usually by the Weight Watchers brand or the Horizon. Both are delicious, though I do find the Horizon to be a bit richer in flavor. Usually I buy the Weight Watchers string cheese, but I will have to keep my eyes out for the Horizon one! Healthy breaded cheese sticks? I can't wait! I love the cheddar Horizon string cheese...yum! This is my favorite string cheese! You can usually also get this at your local grocery store (I've also seen Horizon at Kroger and Harris Teeter). They also have colby cheese in a similar packaging which I really enjoy - it's a few more calories (110 cal as opposed to the 80 cal in string cheese), but it's a nice way to change it up when I get tired of string cheese.